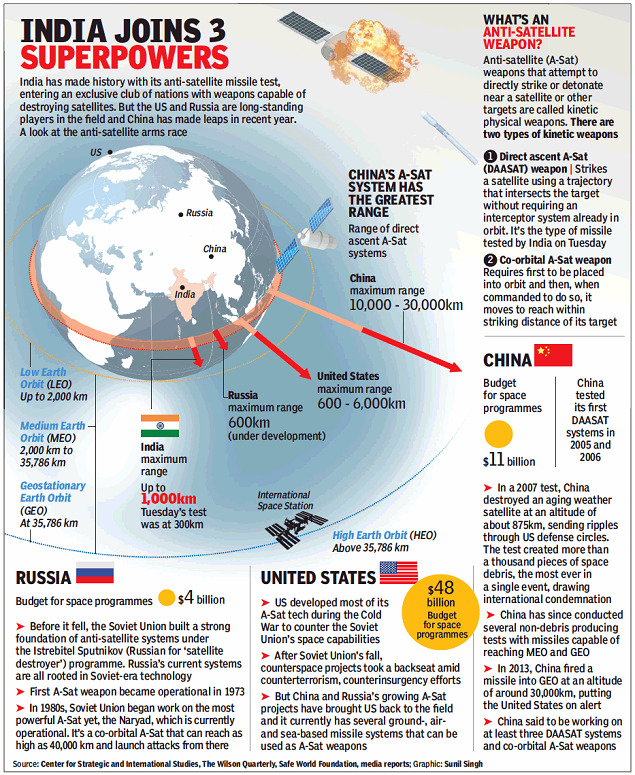 BANGALORE: The test to “kill” a satellite accomplished on Wednesday was a technologically complex mission that synced a host of sophisticated systems even as the mission was kept a tightly guarded secret known only to a small group right up to the day of the launch. “Typically, we get about less than one second to intercept a satellite given its velocity. To overcome this challenge, a host of technologies go into guidance control, mission computer, systems that aid accuracy and relative timing,” DRDO Chief Satheesh Reddy told TOI, without elaborating on the specific technologies or the budget. “The satellite is a different ball game given that the velocity is much higher, the size is small and you have a very short time to collect data. You need appropriate booster vehicles that give sufficient velocity to reach a target in the given time, and you must have an anti-satellite vehicle that tracks the satellite and corrects the distance. You will only have 10-15 seconds to do this,” Chander said. The test demonstrated India’s capability to defend its assets in outer space, with the anti-satellite missile seen as being a major deterrent in a conflict. Scientists explained that these capabilities were also seen to add to the country’s abilities to tackle high-altitude incoming missiles. India has a long-standing ballistic missile defence (BMD) program with multiple missiles already in its arsenal. “As of today, those missiles cannot intercept a target at such altitudes. The ASAT, in that sense, is a game changer that can help our forces tackle incoming missiles at a greater height,” a scientist said. Reddy said 300 DRDO scientists and staff worked on the project day and night over the past six months and yet its scope and objectives were kept under wraps. “Even as of yesterday (Tuesday) evening, not more than five-six people knew about the test today (Wednesday),” he said. The last time India carried out a secret test was in May 1998, when it tested nuclear weapons in Pokhran. Incidentally, the test laid the foundation for India’s ballistic missile program, which is today pegged as one of the best in the world.